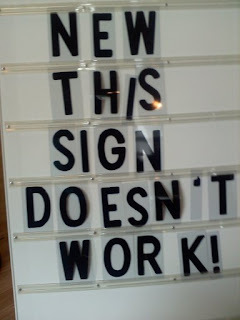 A customer sent me this image today claiming their sign doesn't work. Fortunately for her, the sign is working fine. When placing letters on the sign face, the letters must be inserted into the groove provide on the track face. If the letters are placed behind the sign track, the results are certainly going to be disappointing. The folding sidewalk sign can be a very effective sign, but only if you agree to properly place letters on the sign face. FlexBollard© Will Reduce Maintenance Cost!